Your Personal Information: Personal information is only requested in areas of this web site where we invite the user to request that we respond directly and/or personally. 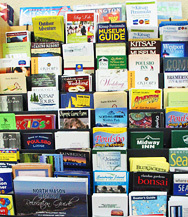 The Visit Kitsap Peninsula does not sell or share users' personal information, other than the information provided to us by member businesses for promotional purposes, with any other outside agencies or businesses. Accuracy and Updates: While Visit Kitsap Peninsula endeavors to maintain accurate information and make timely updates on this site, we reserve the right to change information without notice and are not responsible for costs or grievances incurred as the result of such changes or outdated information. Hyperlinks: This web site may contain hyperlinks to web sites operated by parties other than Visit Kitsap Peninsula. Such hyperlinks are provided for your reference only. Visit Kitsap Peninsula does not control such web sites and is not responsible for their contents. If you find hyperlinks that are broken or inappropriate, please report them to us.